When we woke up Wednesday morning, we raised our curtains and saw a magical land of white. Despite being so extremely far north in the world, and in nearly-winter, I still didn’t expect snow for some reason. When we had arrived, it was rainy and windy, but I just didn’t think it would snow! So, I was thrilled to see a layer of white over everything. I thought it was probably only a dusting, but when we put on our shoes to head over to breakfast, our feet sank at least an inch or maybe even more! I was almost giddy with excitement, and I think Romeo got into the spirit of the snow; he lobbed a snowball at my back! We proceeded to tromp through the snow to the main building for breakfast. Near our cabin, we saw tracks. It looked to me like one set was some kind of small hoof, maybe a deer. The other set was definitely dog-like. Romeo thought maybe they were both dog, but we couldn’t be sure. Since our cabin was in a clearing near the woods (not thick woods, but definitely thick tree cover), we thought maybe it could have been some kind of wild animals. After all, we were in Iceland, a land where nature is far from tamed. We made it to the main building and had a very good European style breakfast, complete with meats, cheeses, breads, and fruit. We decided to take it easy that day, since it was still pretty overcast and threatening to storm on us. We hung out at the cabin most of the day, but ventured out in the afternoon in search of food. We didn’t want to go to the same restaurant, but there wasn’t too many options so we went to the one other recommended restaurant in Selfoss: Kaffi Kafe. I navigated Romeo to the area and we parked across the street at a grocery store. We walked across the road, dodging the ice patches in the roads. We got to the entrance and tried the door but it seemed locked. I tried it twice to be sure. Since the door was on the side of the building, we thought maybe the main door was actually on the front or other side of the building (nothing screamed “front door”), so we walked around. There were windows that showed people inside enjoying their food and coffee, but the next door we encountered was on the other side of the building. We tried that handle and it turned. As we opened the door, I knew in an instant that it was wrong. In the 2 seconds it took to open the door all the way, the entire kitchen crew had turned to stare at the gaping doorway. Broom and mop handles fell through the open door, and we started, embarrassed. I tried to recover with, “Um, where is the entrance?? ?” When a guy responded with, “On the other side,” I responded that it was locked. He just said that the handle is stiff sometimes. Errrr... Awkward! We walked BACK around, totally embarrassed, and someone opened the door for us. I swear that the door had been locked... But, alas. We entered and grabbed a seat, were provided menus, and we chose some very delicious looking meals. Romeo had a burger and I had a lobster pizza. As we waited for our food, we looked at the delicious desert counter and decided we should save room for some. Our food came and we devoured it. My pizza was very delicious, and Romeo enjoyed his burger. We got a slice of Bailey’s Cheesecake (made with Bailey’s Irish Cream) and it was sooooo good. After such a scrumptious meal, we agreed that the next one we should cook to compensate for such high prices in Iceland. We stopped at the grocery store and grabbed a box of mac and cheese. Initially, we had planned to go to a swimming pool (discussed further in the next blog), but we were quite full and once we got into our warm cabin, we couldn’t be bothered to leave again. We spent the evening watching movies and relaxing, watching the snow-covered branches of the trees outside our windows sway in the wind. We drank hot chocolate and thoroughly enjoyed our evening. The next day, we again enjoyed our breakfast at the guesthouse. The weather was even worse; a freezing wind with constant drizzle. We weren’t too excited about the prospect of getting out in that weather, but as we were set to checkout of the guesthouse, there wasn’t much choice. We got ready and took our time, finally checking out around 12:30pm. A side note: both of our accommodation locations in Iceland were extremely relaxed. Neither of them had us fill out tons of paperwork, we paid at the end of the stay*, and they didn’t have any set check out times which allowed us to take our time and leave when it was convenient for us. We booked through booking.com, so I’m not sure if that was the reason, or if they’re just super relaxed in Iceland, but either way: I liked it! After we checked out, we debated what to do. We had wanted to see Kerio Crater which was only about 10 miles away, but the weather was so terrible and it required a hike. Instead, we decided to go swimming. Iceland has lots of natural geothermal pools and hotsprings due to its location. A very famous one is called the Blue Lagoon. Unfortunately, the Blue Lagoon costs approximately $50 each for the basic entrance fees. We decided to go somewhere less touristy. Many towns and cities have swimming pools that use the water from the naturally heated springs. These are usually around $5 entrance fees. Conveniently, there was one such location less than a mile from our guesthouse in Selfoss. We were a little nervous, since the pools are OUTSIDE usually. But, we got our bathing suits out and headed over. The facilities struck me as similar to a YMCA or some kind of neighborhood rec center. We paid the entrance fee, about $4 each, and went into our separate changing rooms. 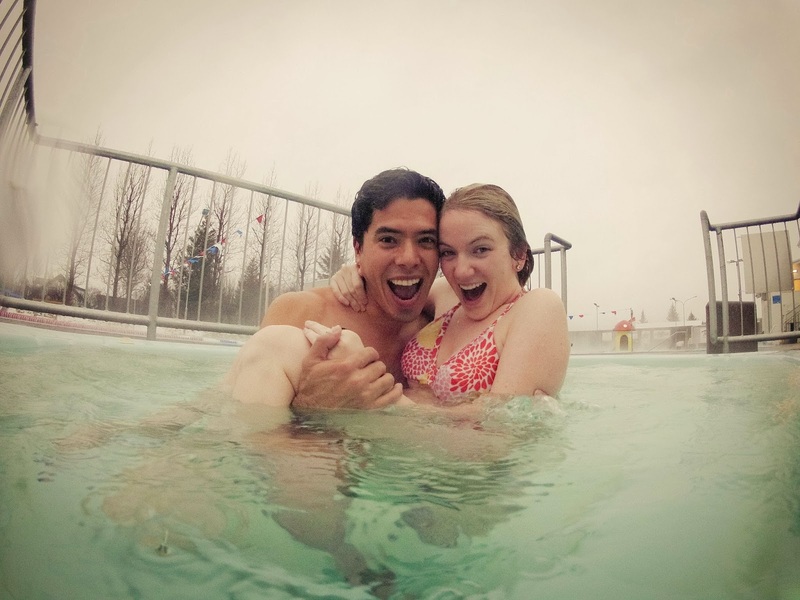 Iceland requires bathers to wash naked with soap before entering the pools. I chose a locker in the women’s changing room, and got naked. As I was attempting to modestly de-robe, about 20 4th-5th grade girls came in. I guess the school next-door uses the facility for their gym class or swim teams or something. Anyway, I was properly embarrassed and found a shower head with a partial blocked view from the rest of the showers (no stalls, just shower heads in a large room) and rinsed off quickly. I had literally just taken a shower at the guesthouse, had put on no lotion or other products, so I was a bad guest and didn’t use the soap provided (oops). I met Romeo outside the changing rooms where there was an indoor pool. It was fairly utilitarian, a basic rectangle with lane markers. We had our towels modestly wrapped around us and made our way to the doorway. A bunch of kids were hopping in the pool and running in and out of the outside door, freezing bursts of air hitting us as we contemplated what to do. Eventually, we just said, “Lets go!” and ran outside. We made our way to the closest pool, which ended up being a toddler pool. However, we didn’t care and the water felt amazing as we eagerly doused our cold skin with it. 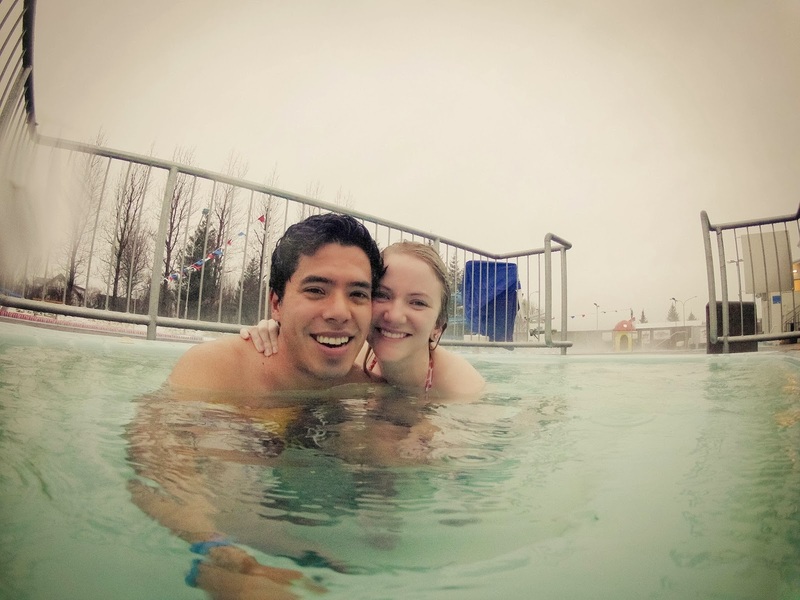 After a moment to get adjusted, we spied an unoccupied hot tub nearby and ran to it. Finally, we were fully emerged in the water and letting our cores warm back up. The weather was terrible. It continued to drizzle, the temperature hovering around 1C. However, being in the water made it so much better. When some of the fog lifted we could see the white mountains in the background and it was a bit surreal. We tried all the different hot tubs with varying temperatures (all of them being quite warm to very hot). Eventually we decided to try the actual swimming pool (complete with a SLIDE) and found it slightly cooler but still very bearable. Unfortunately, the big slide was closed so we couldn’t enjoy that. It was probably a good thing since the walk up the stairs would have been horrible with the wind and rain. After a couple hours between all the different pools and watching the kids doing their swim practice in the lap pool, I had had enough of the rain in my face. It was quite comfortable, temperature wise, but the constantly mist, and occasionally harder drops, in my face was annoying. We headed inside and rinsed off and got dressed. By that time, we were pretty hungry and decided to make our way back to Reykjavik, where we would spend our last night in Iceland. We stopped by one of the famous hot dog stands in Iceland and Romeo had a dog. I decided to save myself for a good meal in Reykjavik. We drove back, which took around an hour. We took a more direct road, but it wasn’t nearly so scenic, and there was a lot more traffic. At one point in the drive, the fog got so bad our visibility was down to about 30 yards. I was so glad Romeo was driving, because I can’t handle situations like that. It made very nervous, but he handled it well and eventually it cleared completely. When we got into town, we headed back to the guesthouse we had stayed at the previous time. We checked in smoothly and dropped off our stuff. I used Yelp to find a good Indian restaurant in downtown Reykjavik. We hopped in the car and headed out for some dinner. Luckily, even though we had to pay to park in downtown, it’s only required until 6pm and we parked around 5pm, so we only had to pay for an hour. We had a delicious meal, but it was a little more expensive than we thought it would be. The menu said “for 2 or more people” but I guess that meant PER PERSON, because our bill was double what we expected. Luckily, that wasn’t too terrible. After dinner, we decided to walk around downtown and check out some of the shops. However, the rain picked up and most shops closed at 6pm anyway, so we didn’t get to do much else before heading back to the guesthouse.